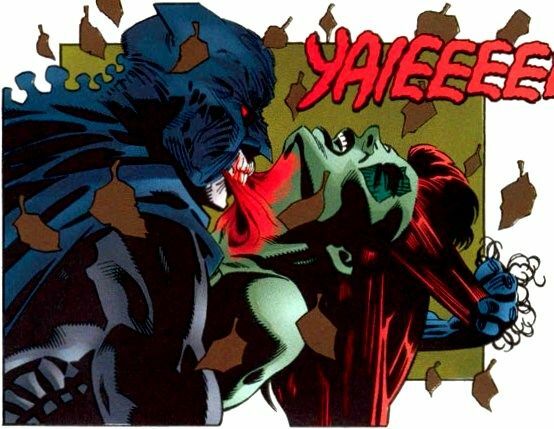 After discovering that the fabled vampire, Dracula, was still alive and well in Gotham City, Batman enlists the aid of Tanya, a rogue vampire who managed to break free from Dracula’s control. He has Tanya drain some of his blood, transforming him into a vampire without destroying his humanity. Now possessing the power to kill Dracula, Batman and Tanya lure Dracula’s minions into the Batcave, where Batman destroys the roof of the cave to expose all of the vampires to sunlight. With most of the vampires destroyed, Batman confronts Dracula and kills him by impaling the ancient vampire on a tree that was destroyed by lightning. However, the victory comes at a cost – during the fight, Dracula successfully drained the last of Batman’s blood, destroying his humanity. Nonetheless, Batman retains his sense of self and assures Alfred that only Bruce Wayne has died; the Batman will live on, and thanks to his new vampiric powers, he will be able to protect Gotham City forever. Batman’s life (such as it was) continued much as it had before in the wake of the battle with Dracula until the Joker took command of Dracula’s remaining minions in a bid to monopolize Gotham’s criminal underworld under himself. With the threat of an entire army of blood-sucking abominations looming on the horizon, Batman joined Catwoman (who had become a werecat after being bitten by a vampire that turned to a werewolf), Commissioner Gordon, Alfred, and a group of Gotham police turned vampire hunters to kill the remaining vampires. While the humans destroyed the infected crime bosses during the day, Batman and Catwoman tracked the vampires to a warehouse and battled them during the night. Although they succeeded in killing all of the vampires, with Catwoman personally slaying the one that had turned her, Batman lost his supernatural companion when she took a fatal crossbow bolt aimed at him. Overcome with rage over the death of the only person able to control his bloodlust, Batman killed the Joker and drained all his blood. Horrified by his actions, Batman asked Commissioner Gordon and Alfred to drive a wooden stake through his heart, in order to prevent him from causing any more deaths. Unfortunately for Batman, being staked through the heart only served to put him in a coma. Several months later, with Gotham City overwhelmed with crime, Alfred released his former master in an attempt to give Gotham a savior again. However, a combination of his decaying body, his long-abandoned humanity, and an unquenched thirst for blood had destroyed the last of Batman’s sanity, reducing him to a vicious monster only concerned with satiating his literal bloodlust. To this end, Batman begins systematically hunting down his old enemies (Penguin, Riddler, Poison Ivy, Black Mask, Scarecrow, Amygdala, and other Arkham inmates) and draining their blood, decapitating them afterwards to prevent them from rising as more vampires. The last two villains, Two-Face and Killer Croc, form a desperate alliance with Commissioner Gordon and Alfred to lure Batman into his new lair (the ruins of the Batcave) and set off explosives to expose Batman to the sun. However, during the struggle, Two-Face and Killer Croc attempt to kill Commissioner Gordon and Alfred, forcing the latter to offer his blood to Batman. The impromptu meal gives Batman the strength to save Gordon by killing Two-Face and Killer Croc, and also appears to have restored enough of his sanity to make him aware of what he had become. In the end, Batman convinced Gordon to set off the explosives. Gordon is crushed by rubble in the explosion, and Batman walks into the sunlight, hoping that he will finally have the peace he’s been seeking since his transformation. Vampirism: In addition to the various mental and physical benefits that vampires are heir to, they also possess the ability to turn others into vampires as well. Each new vampire is traditionally subservient to the one who “turned” them, but some strong-willed vampires have been known to rebel against their masters. Invulnerability: Vampires are invulnerable to most forms of injury (certain exceptions apply). Bullets, blades and blunt objects do little to no damage to a vampire’s body. Superhuman Strength: A vampire’s strength level is several times that of a normal human being and they are considered superhuman. Superhuman Stamina: So long as they continue to consume human blood, a vampire can function tirelessly without rest or relaxation. However, a vampire’s stamina wanes the closer it is to sunrise. Transformation: Vampires often possess the ability to transform into a variety of creatures or effects such as bats, wolves, rats or even mist. While their physical attributes may fluctuate during such states, a vampire’s mental acuity is the same as that when they are in their human shape. A vampire who transforms into an animal may also benefit from that particular animal’s attributes including razor-sharp claws, fangs or the ability to fly. Metamorphosis: Only vampires with a more advanced powers Control demonstrate the ability of altering either its appearance to imitate other people or in such cases selective transformation for creating claws to increase the lethality of its attacks in extreme cases and only vampires with a capacity of very advanced monitoring capabilities such change would show how elements, elasticity and other capabilities which vary depending on their ability, imagination and control, because as you know some vampires are stronger than others. Next PostNext Top 5 Anti Heroes in Comics!